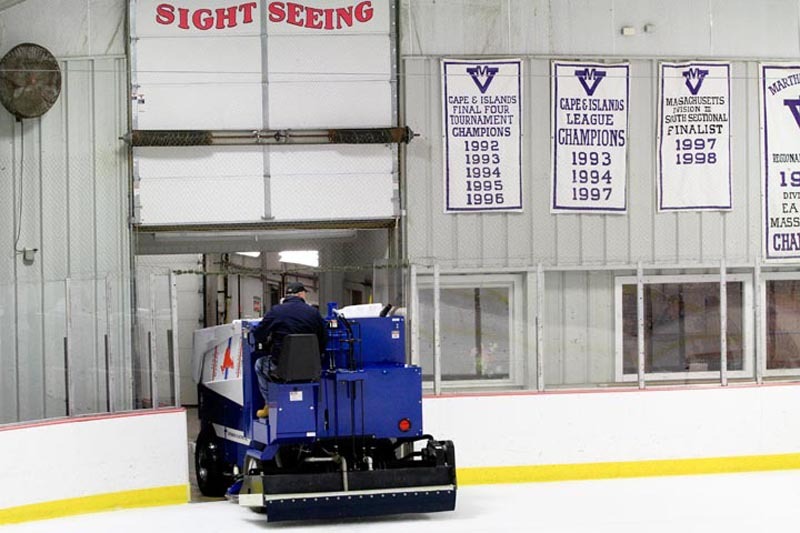 Built from the ground up by the Island community, ice arena needs repairs. In the mid 1970s, shortly after the all-volunteer crew had begun work on the exterior walls encircling the patch of ice that would become the Martha’s Vineyard Arena, a gale swept through the Island and knocked down nearly all the cement blocks, destroying the steady progress. A call went out. More volunteers rallied to the cause. The walls were restored and work continued. “Funded by donations and built entirely by volunteer labor, the arena project has been a true community effort,” wrote a Gazette story covering the reconstruction effort. That line could have described virtually any stage of the arena’s evolution, from its beginnings as a flooded-over field — which was cleared by volunteers, although they did end up going home with a nice amount of firewood — to its most recent improvement, a new Zamboni purchased in 2010, thanks to a hefty anonymous donation. Today, the facility offers both winter and summer recreation — summer skating programs and camps began in 1993 — and its board of directors is embarking on its most ambitious renovations project yet in order to accommodate the demand. The arena’s annual summer fundraiser will be held this Saturday at Hooked, and features brunch, a bottomless Bloody Mary and mimosa bar, and plenty of auction items. Chief among the priorities for renovating the arena are addressing the matters of the roof which leaks, and the insulation, which doesn’t exist. The arena is one of the largest consumers of electricity on the Island. Adding insulation would cut utility costs in half, development director Christine Todd said. The next phase of arena improvements includes expanding the lobby and pro shop, taking these spaces to the next level, literally, by adding a second story within the arena walls. The second-floor space would include a heated viewing area overlooking the ice. The board of directors conducted a feasibility study for potential improvements last spring and is working with the Vineyard Haven architecture firm Mashek and McLean. “It became clear to me that there were these big needs that needed to be addressed,” Ms. Todd said. The first, of course, was the need for an arena. The occasional temporary rink had sprouted up on the Vineyard in the past, but skaters largely relied on the whims of the weather to provide them with frozen surfaces. “I missed playing hockey,” former arena president Donald Lambert recalled. Before moving to the Vineyard, Mr. Lambert had played hockey for the Montreal Canadiens junior team and, after his family moved to the United States, the St. Louis Blues semipro team in Braintree. He got a “real job,” as he put it, after separating his shoulder while with the Blues organization. Mr. Lambert and other hockey enthusiasts traveled to Falmouth each week to use the facility there. The Vineyard contingent had the rink for two hours: the first was for adult league hockey (Reds vs. Blues) and the second was for youth instruction. Mr. Lambert, aided by the Falmouth officials, created the nonprofit organization that would become Martha’s Vineyard Arena Inc. Others — Red Kennedy, Jimmy Gibson, Nan Rheault and Tucker Wilson, to name a few — joined the cause, despite the fact that not all had much skating experience (“Red Kennedy never put a pair of skates on,” Mr. Lambert recalled). But they knew people wanted a place to go in the winter. They wanted Island kids to have a place to go. Land was secured — three acres in Oak Bluffs, donated by the school committee, was deeded to the arena on August 24, 1974. Fundraising took place slowly but steadily, with contributions trickling in from an envelope campaign and frequent ads in the paper. At one point, Mr. Lambert met with Fairleigh Dickinson Jr. and secured a $150,000 donation, which enabled the arena board to make a bid on ice-making equipment from the 4 Season Arena in Walpole, which was going out of business (the bid was successful). The mats which lay beneath the ice were originally to be used at rinks in the Lake Placid Olympics, but were manufactured to be the wrong size — so the arena bought them for half price. The rink was opened in the winter of 1974, in its original frozen field incarnation. Small improvements continued over the years — the low external walls surrounding it, a building lobby at one end, a roof. Roof met wall in 1987, fully enclosing the rink and securing it against the elements for good. Mr. Lambert stepped back from his founding role since, as he explained, “the rink took off by itself.” The board president torch was taken up by Sam Sherman, who would also start the girls varsity ice hockey program and, later, Richard Barbini, Brion McGroaty, Michael McCormack, Jim Pepper and Jevon Rego. Kurt Mundt, the general manager of the arena, overseeing daily activity and scheduling ice times for the many organizations that use the facility, came on board in 1991. There were other needs, chief among them locker rooms for the high school players, youth teams and figure skating clubs that practiced, played and competed at the arena. The plywood locker rooms were essentially “like little barns,” Mr. Kelleher said; they were carpeted with 1970s shag rug and warmed by a small electric heater. New locker rooms were unveiled in 2003, the result of a six-year-long effort dedicated in memory of high school hockey player Ryan Mone, who had died in a car accident in 1998. The locker room additions were the last major construction project at the arena. “There’s something about this place,” Mr. Kelleher said, telling a story of how Bruins great Bobby Orr, then retired, once visited the arena — and actually skated, something he rarely did at the time. Get Hooked, a fundraiser for the Martha’s Vineyard Arena, takes place this Saturday from 11 a.m. to 2 p.m. at Hooked in Oak Bluffs. Brunch and bottomless Bloody Mary and mimosa bar provided. Tickets are $75. Please call 508-693-5329 for more information.